Everyone diagnosed with HIV should be offered the option to start treatment within seven days of diagnosis and everyone who feels ready should have the option to start treatment on the day of diagnosis, the World Health Organisation (WHO) has recommended. The new guidance was issued on the opening day of the 9th International AIDS Society Conference on HIV Science (IAS 2017) in Paris. WHO's recommendation is based on the findings of a study conducted in Haiti, presented at the AIDS 2016 conference, which showed that people who started treatment on the day of HIV diagnosis were more likely to be retained in care and more likely to be virally suppressed a year later. But, two studies presented on Monday at the conference highlight the need for better preparation of people who start treatment very quickly after diagnosis. The studies also highlight the need for research to identify better ways of screening for patients who are going to struggle with treatment, even if they accept an offer of a rapid start. A study conducted in Uganda found that people who started treatment on the day of HIV diagnosis were two and half times more likely to become lost to clinic follow-up during the year after starting treatment than those who started treatment days or weeks after diagnosis. However, the study also found that once people had been on treatment for at least a month their risk of being lost to follow-up began to fall sharply, and possession of a mobile phone also greatly reduced the risk of loss to follow-up. 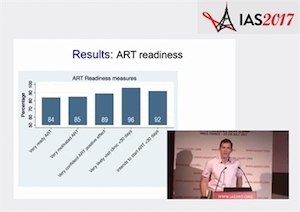 A second study, carried out in Cape Town, found that readiness to start treatment immediately was associated with a better knowledge of antiretroviral therapy (ART) and knowing someone who had already experienced the positive health benefits of ART. People who were surprised by their diagnosis or who were otherwise healthy were around 55% less likely to consider themselves ready and motivated to start treatment.